Maybe it was when Benjamin Netanyahu said Israel would respond to flaming kites from Gaza with an “iron fist.” Or maybe when 13 senators bucked the Israel lobby to call for an easing of the siege on Gaza. Or maybe when five young American Jewish women walked off their “Birthright” trip saying they needed to see the occupation. Hasbara has died. The Israeli effort to “explain” its actions to the world– that era is over. Israel has given up trying to explain itself to fair-minded people. Because the fair-minded have all made up their minds; the slaughter in Gaza has seen to that. And Israel doesn’t think they are fair anyway. No, its explanations are reserved now for the hard-core supporters. The hasbara is pure propaganda, aimed at rallying the base. And everyone else is tuning out. It didn’t used to be this way. Hasbara was a successful euphemism because Israeli propaganda was treated as being of a higher order, and so got wide pickup in the mainstream press and from American politicians. Even when segments of Europe and the left were against Israel, the Jewish state could count on a generous hearing in the hallways of power. Leading journalists such as Jeffrey Goldberg, Tom Friedman, Wolf Blitzer and Terry Gross were happy to carry water for Israel’s side of any controversy and malign those who questioned it, and Dennis Ross was on NPR morning noon and night. These days the streetwise are steering clear. Goldberg spent a chummy hour with Ben Rhodes at Politics & Prose on June 15 and didn’t touch the Israel/Palestine topic. “Not one Democrat has defended Israel over Gaza massacre,” was a headline in Electronic Intifada. The new chief of staff of the Austrian army, the Bundesheer, Major General Robert Brieger has warned that the greatest threat the central European country faces is from uncontrolled mass migration. Major General Brieger said that due to a lack of concrete border protection on the external borders of the European Union, all member states faced a threat from mass migration including the possibility of future terrorist attacks, Kronen Zeitung reports. “The migration problem has developed in such a way that all member states of the European Union are affected. Until external border protection is fully guaranteed, there is a need to act at a national level,” Brieger said. Defence Minister Kunasek also said that he would be looking to greatly increase defence spending, which currently sits at a mere 0.58 percent of GDP, to one percent of Austria’s GDP by the end of the current legislative period which ends in 2022. Since the formation of the conservative-populist coalition government of Chancellor Sebastian Kurz’s Austrian People’s Party (ÖVP) and the FPÖ led by Vice Chancellor Heinz Christian Strache, the Austrian government has undertaken measures to stop illegal mass migration and increase border security. This is something I thought I'd never say. Ever. But if and when Trump runs again in 2020 I'm voting for him. A Republican (sorta). Why? To complete the revolution and the destruction of what was the proud DNC that's now been contaminated and riddled with intellectual putrescence. Nearly one year ago today, the impossible happened, Donald Trump was elected to be the 45th president of the United States. The point is that some independent analysts saw beyond the mainstream media propaganda and thought Trump could win (if he could get past the vote rigging). Attached to the establishment media were fake alternative news sites like The Young Turks. They all spewed the same heavily biased message. However, in terms of predicting the outcome of the election, people with rational minds could see that Clinton was massively unpopular. Huge numbers showed up to Trump rallies and almost no one showed up to the Hillary Clinton events. What this election proved was how dishonest and controlled the mainstream media people were and their lapdog pollsters. It showed a wider Deep State at work, and that they failed to get the favoured candidate into office. Mistakes were not made here. Polling companies don't deliberately over sample Democrat voters by accident. Those who looked closely at what was going on, like Bill Still, pointed to the Trump victory. The lessen is that the system is rigged - in favour of the establishment - but that the people are awake enough to see past smear campaigns and vote in someone who identified real (economic) problems that needed to be fixed. And then there’s the fact that several weather stations are literally located directly in the exhaust paths of super-hot jet engines. Polar and Greenland ice has actually increased significantly in recent years. The reason for the glacial ice loss in much of the Northern hemisphere is due to particle pollution that slightly darkens the snow and ice causing it to absorb heat and melt. This melt, combined with the slight warming we experienced since the last severe cold episode in the late 70s, is what is seen as 'man made global warming'. Now that the Earth has entered a new cooling phase, thanks to diminished energy coming from the Sun, the ice sheets will return, despite the fact they are impacted by particle pollution. CO2 in the air has done almost nothing to contribute to the process. Tucker: If then-candidate Trump knew about his campaign's meeting with a Russian lawyer at Trump Tower in June 2016, where is the crime? Keep in mind that the Democratic National Committee and the Clinton campaign both paid a foreign national named Christopher Steele to gather damaging information on Trump from other foreign nationals, including Russians. It seems too stupid to even be funny, but it’s true. This week, the Madcap Mueller probe announced that they will try to prove that the President obstructed justice via his public Twitter tweets. But in the words frequently attributed to that sage of Democrat politics, Billy HotRod Clinton: “it’s the economy, stupid”. What does it mean? To the vast center of the American electorate, all that matters are pocketbook issues. Keep a chicken in every pot and you are good to go. Well, Judge Jeanine addressed the economy question about 10 hours ago. While the US economy is still in a poor way, Trump's trade policies are the right way to go. If he can turn the ship around Trump will keep winning in the minds of the voters. At the moment people will give Trump the benefit of the doubt if there is any delay because they see he is being obstructed by the establishment and their lapdog media. The globalist elite are coming for the nationalist populists by trying to pass laws preventing us from even running for office. Share far and wide, please! Thanks everyone. We have to keep going! NASA announced recently that it discovered organic molecules on Mars. In a press release, the agency said that the Curiosity rover discovered new evidence in rocks suggesting the planet may have supported ancient life, along with new evidence in the planet’s atmosphere related to the search to find current life on the planet. The findings include organic molecules in sedimentary rocks that are billions of years old found near the planet’s surface, and they also discovered seasonal variations in atmospheric methane levels. Although it’s being touted as a “new” discovery, Mike Adams says NASA had proof there was microbial life on Mars as far back as 1976, when the Viking mission found it with mass spec equipment. On that occasion, Gilbert Levin, who was tasked with heading the mission’s life detection experiment, said that space probes found signs of life on Mars but it was covered up. The scientist has been critical of NASA ever since. He theorized that microorganisms may have made their way to Mars in a frozen and dried state after being injected into space from meteor strikes. Carl Sagan even reportedly congratulated this scientist on what many considered one of the greatest discoveries in science history, but it was quickly covered up. In a video posted to the free speech platform REAL.video, Mike Adams talks about how NASA covered that up for political reasons, which begs the question of what else they might be covering up. He also talks about why carbon in the atmosphere is essential to life rather than the pollutant that the global warming camp would have you believe. WikiLeaks founder Julian Assange is a step closer to being evicted from the Ecuadorian embassy in London after President Lenin Moreno said the whistleblower must "eventually" leave the facility. Mr. Zimmerman spake thusly: "How does it feel, how does it feel? To be without a home. Like a complete unknown, like a rolling stone." We're shelved, shadowbanned and throttled by thought police and vigilantes daily by the DS swamp and its lieutenants and none of them seemed to get how unfair that was. Maybe they do now and all that changes. Whattaya say? Go to https://www.FreedomWatchUSA.org to Support Our Citizens Grand Juries. The police in the UK need to charged with obstructing justice (for starters). The report by the Federal Office for the Protection of the Constitution (BfV), which was released this week, shows that the number of radical Islamists now totals 10,800, up from 9,700 the year before and shows a more than doubling of the number from five years ago, Die Welt reports. The newspaper has also claimed that the number of radical Islamists coincides with an increase in the number of criminal cases in which a radical Islamic motive or background was suspected. The BfV noted that Germany is still in the crosshairs for radical Islamic terrorism and that the situation is still very serious. The agency said that they have identified around 1,880 individuals in Germany who they believe may have the potential to carry out a terrorist attack and more worryingly, that the number was continuing to rise. The number of terrorism cases has also greatly increased between 2016 and 2017. Last year the agency said there had been 1,200 terror cases initiated, 1,000 of which were related to radical Islamic elements. In 2016, the total number was 250 with 200 of the cases being linked to radical Islam. The report echoes that of other security agencies in Europe which continue to reveal a rise in the number of radical extremists. Sweden’s security agency Säpo reported that the number of Islamic extremists last year had risen to 2,000, a ten-fold increase from 2010. In France, the terror watch list, known as the S-File, is said to contain around 20,000 individuals and the danger is expected to increase in the country as 450 convicted radicals are set to be released from prisons across the country by the end of next year. Around 50 of the released prisoners are considered to be terror threats. In this episode of the Keiser Report from New York City, Max and Stacy discuss the indigenous Mexican community who drove the politicians out and then watch as the crime rate plunged. They also look at the Pence family’s socialized cost to their private family fortune as taxpayers are forced to clean up the toxic mess left behind by their failed gas station business. In the second half, Max interviews Bill Ottman of Minds.com about taking on the corporate social media behemoths like Facebook and Twitter with Minds, a new blockchain-backed social media platform. Tucker advocating for peace, pointing out that Sunni Muslims constitute the radical terrorists, whereas the Iranians are their enemies, and on the same side as the US in this fight. This clip includes the warning about a false flag attack that was previously aired on this site. Trump Tweets War Warning, Pompeo Wants Regime Change: US Iran Attack Coming Soon? President Trump sent out an angry, all-caps, Tweet last night, warning Iran that it would suffer "consequences the likes of which few throughout history have ever suffered before" if it threatens the United States. This came after Iranian president Rouhani said that peace with Iran would be the "mother of all peace" but war would be the "mother of all war." Secretary of State Pompeo also joined in, announcing a new US government propaganda media outlet aiming to push Iranians toward regime change and calling the country's leaders "mafia-like." Well-funded neocon think tanks in Washington like the Foundation for the Defense of Democracies are dedicated to war with Iran. Will they succeed? It's only mental illness if they're not white. Sara Carter and Joe DiGenova went on Hannity tonight and explained why 11 Representatives filed Articles of Impeachment against Rod Rosenstein. Why Articles of Impeachment instead of a preliminary step which would be holding Rosenstein in contempt of Congress? Because Rosenstein would just ignore it, then it would come down to having to vote on whether or not to have the U.S. Marshalls arrest him. But then what - go through the impeachment process? So let’s just skip the useless step then, and go right to the heart of the matter. Because face it, as long as Rosenstein remains in office, justice will never be served on the dozens of former government bureaucrats where there is clear evidence of criminality. So let’s get rid of him and impeachment – upon conviction – makes it impossible for the convictee to serve in government. So what is impeachment? Impeachment was created to boot lawyers in government service out of government service – be they elected officials or bureaucrats – because lawyers know how to skirt criminality – or the prosecution of criminality - by using their knowledge of the law, and connections in the bureaucracy to get away with things that are clearly wrong and that normal citizens would be prosecuted for. If criminality can be proven, then the remedy is not impeachment – the remedy is a grand jury indictment, followed by a trial before a jury of peers. But when gross mismanagement is the issue, or stonewalling, or threatening the very committee of Congress charged with overseeing this conduct, then that falls short of indictment, but it’s clearly wrong and unjust, and therefore squarely falls within the confines of the role impeachment was created to serve..
MEXICO IS PAYING FOR THE WALL!!! TRUMP WINS HUGE!!! Bloomberg reports, Mexico president-elect Andres Manuel Lopez Obrador called on U.S. President Donald Trump to pursue renewed North American Free Trade Agreement negotiations aimed at a final agreement including all three countries in the pact." A very good discussion about the economy. They open by pointing out that the new President of Mexico is also a nationalist who wants to improve the internal economic conditions in his country. A great point is made explaining that the top stocks on the Dow Jones are massively overpriced. Keiser Report (E1258): How Much Do Wall St. Managers Cost US Taxpayers? In this episode of the Keiser Report, Max and Stacy discuss how deindustrialization and financialization have destroyed the economic viability of communities across America. The latest study from YahooFinance finds that state pension fund managers have blown over $600 billion of taxpayer funds on overpriced, underperforming hedge fund managers in the past decade alone. In the second half, Max interviews author and banker, Mitch Feierstein of PlanetPonzi.com, about Trump’s trade war, stock buybacks and the latest in the bond markets. Expect a "Gap" in Arctic ice measurement as ageing satellites are all planned to go down at the same time starting next year. Beyond that strange circumstance, the replacements planned are now on hold as NOAA's newest launch malfunctioned and all other launches are on hold, which include ice mapping satellites for a gap of 4 years, all while Arctic ice begins to recover in cooler water pulses into the Arctic and the Grand Solar Minimum intensifies. Its as if the satellites are being purposefully taken off line so the media and governments of the planet wont have to explain why ice recovered so quickly with such summer thickness. Climate change is supposed to be the greatest threat to our civilisation and yet nothing is being done to replace the decaying satellites? This stinks! This circumstance is more in tune with the Global Warming threat being a scam rather than it being a 'world ending' situation. The colours of the sky on Earth are a function of our relatively thick atmosphere. Our blue skies occur due to the scattering of the blue wavelength of light from white light coming from our star. The sky looks orange when the Sun appears at a low angle in the sky because the light travels though more atmosphere and the blue wavelength has been scattered away leaving the longer red wavelength. Dust in the atmosphere also contributes to the sunset colours. The clouds and other aerosols reflect these colours. If we believe NASA, the atmosphere on Mars is as thin as on Earth at 100,000 feet. From near 70,000 feet and higher the sky looking upwards on the daylight side of Earth is black. To have a red sky would require a lot of obstruction (dust or gas) to block out or scatter the blue wavelengths. According to NASA's own claims the red sky cannot be due to gas. The problem is that we consistently get orbital pictures of Mars that does not show any of the dust haze that would be needed to get the consistent orange-red skies NASA shows. On Earth, if you get orange daytime skies it is in conditions of a dust storm. The clear orbital pics should mean we see black skies, like on Earth at high altitude. Either the orbital pictures are in error or NASA's red sky pictures are not true colour representations. In fact early pictures from Viking and even some pictures from the current set of landers/rovers show blue skies. This is indicative of a thicker atmosphere. It also would account for surface features that look like water run off channels - near impossible in a super thin atmosphere, but easily explained if the atmosphere was slightly thicker (like on Earth at 29,000 feet - the top of Mount Everest). The argument being made here is from basic scientific principles and observations. To get the red skies NASA shows on Mars you need a LOT of dust. The fact that we often have clear skies (no haze), and no black sky pictures, and the fact that we sometimes see blue skies, is indicative of NASA portraying Mars with false colour imagery. If blue is eliminated from the colour pictures then you get lighter surface details. The problem is you also end up with false colour (red) images of the sky. Blue has been removed from the image. If blue is added back in, and we end up with a blue sky, then Mars has a thicker atmosphere than we've been led to believe. According to the text books Mars has very low surface air pressure which is 0.6 of the sea level pressure we have on Earth. The pounds per square inch is 0.087 (psi) to our 14.69 (psi). Images of the Martian sky taken in these alleged conditions often reveal an orange or grey-blue sky. At 0.087 psi the level of Martian air pressure is similar to the very thin atmosphere on Earth at an altitude of 100,000 feet. According to this chart the psi on Earth at 100,000 feet is 0.162 compared to Mars at 0.087. HOWEVER, the problem we face is that during the daylight hours on Earth at 100,000 feet the sky appears black. On Mars, with a similar air pressure, looking upwards we are not treated to a black sky during the daylight hours but something either reddish or blue-grey. We have been *told* that the colour of the Martian sky is due to dust particles suspended in the atmosphere. BUT without dust, or even with small amounts of dust, and having such a thin atmosphere, the sky should conform to the same physical principles we find on Earth - the sky will be black. On Earth, if we find ourselves looking skyward at a reddish hue we need either a lot of dust, like what one sees during a dust storm (in which visibility becomes obstructed); or instances where the Sun is shining low in the sky (through a lot more atmosphere) and the Rayleigh light scattering effect has turned away the blue wavelengths of light leaving the longer wavelengths of light (such as red) to travel in the direction of the observer. Also causing the red colouring on Earth is the Mei light scattering effect that interacts with larger sized particles (dust) at lower altitudes to cause red sunset colours to dominate out of the Sun's spectrum of light. The problem we face with Mars is that there is an allegedly thin atmosphere and a distinct lack of haze from dust in the sky - except when there are dust storms. Looking at the thousands of high resolution images taken of Mars by the European Space Agency probe Mars Express you can see pictures without noticeable dust haze. Many of the pictures are stunning because of their clarity. If the atmosphere was always full of dust - enough to cause a red hue- then we should almost always see instances of dust haze, just like on Earth when we find orange sky situations. One should note that on any Earth day there is actually dust suspended in our relatively thick atmosphere - car filters pick it up all the time - and yet looking upwards - we see no red hues. All we are greeted with is the blue glare from the Rayleigh effect as white light interacts with small gas molecules in our atmosphere. At night time, we still have our atmosphere, with the dust, and yet when we look up, there is no red hue, even when we have the stronger levels of light reflected directly off the Moon, absent the excessive blue glare from the daytime Rayleigh effect. Looking at the Moon we commonly see the white Sun light, and the grey and darker surface colours, being reflecting off the Moon - plus occasionally we see it as yellow thanks to mild Rayleigh scattering and dust effects - but no reds like in the Mars pictures. With such a thin atmosphere on Mars, the sky should be predominantly black, just like on Earth at 100,000 feet, with occasional instances of redness from dust storms. The idea that there is enough dust always suspended in the thin Martian atmosphere to give a constant red hue seems extremely unlikely. It has also been claimed that the red Mars we see, that looks like a star in the night sky, is due again to suspended dust in the atmosphere - in combination with the planet's surface colour. Yet when we look at the Moon we see its colour does not come from dust suspended in an atmosphere, but from the dark surface, the Sun's white light, and the effects of our own atmosphere. The same can hold true of Mars and we should not automatically accept that dust in the atmosphere must be the primary element - although such an effect is present when there are dust storms, which is to be expected on a planet that comprises mostly of desert. The bottom line is that according to the official account - with a thin atmosphere - the Martian sky should theoretically be very black. There is no evidence to show that there is enough dust continually suspended in the clear sky to create the haze needed to produce an orange sky we see in the official pictures - the ones labelled as showing the true Martian sky colour. 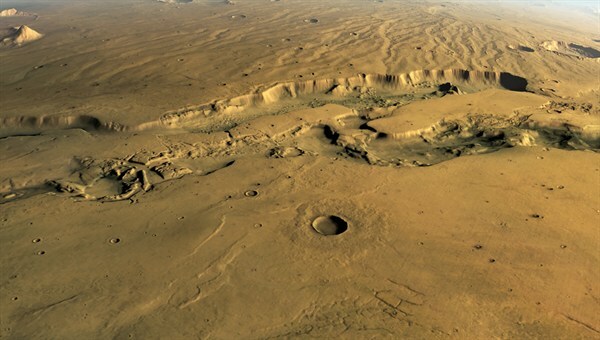 The same process we find Earth works on Mars - the basic physics does not change. What is more likely, is that the sky we see in the Martian pictures is much thicker than what we have been told. This thicker atmosphere would account for 'wash features' on the surface plus many of the images we find with blue-grey sky colours. The orange clear sky colours would be the image 'enhanced' pictures released by NASA, not the true colour pictures. At present many scientists are having trouble explaining the liquid water related phenomena (http://rt.com/news/water-flowing-mars-nasa-evidence-470/) because water would evaporate rapidly in the officially endorsed low pressure environment. The Atmosphere of Mars - Thicker than Officially Admitted, Clouds, Liquid Water and Life? Did NASA Discover Life on Mars - 36 years ago? President Trump stands up for America and delivers a strong warning to Iran, but the deep states’s agenda is war. Tucker Carlson warns president Trump about a possible false flag. One correction. While the Chinese have bought up a lot of influence in the USA the real elephant in the room are the Zionists who are connected to the neocons. The big danger is a false flag from a US-Israeli source. FBI officials all lied to the FISA court when they signed off on the veracity of the Steele Dossier. The cover-up here is bigger than, and worse than, Watergate. Alex Jones breaks down the latest hypocrisy from Hillary Clinton, who criticized President Trump for meeting with Russian President Vladimir Putin in Helsinki, when she met with the Russian leader in Moscow several times as Secretary of State. Media Meltdowns Actually INCREASE Trump’s Approval Ratings!!! The media hysterics are only fueling Trump's populist support!!! The media has become transparent as an establishment (citizen oppressing) tool, whereas Trump is still steering the country on the right course in terms of repatriating US jobs, fixing the borders, and other matters. Cut it by 100% and I'll be even happier. Waleed Aly on African Gangs: Acknowledging Reality is Racist! Islamic State is apparently trying to make a comeback in Iraq - with the number of terror attacks doubled in the past month in the country. The undersigned introduces himself by offering a short résumé of his career as appendix A, subject to further specification as may ultimately be required by this Court. The undersigned is a specialist in forensic science and medicine, and in British, American, and Canadian constitutional law and history, in both of which fields he has many publishing credits. He has been permanently and generally admitted to the bar of five courts of record in the United States. Beyond his native Minnesota, he has practiced pro hac vice before twenty-eight state or federal courts of record in fifteen jurisdictions of the United States over the course of nearly fifty years. He is a member in good standing of the bar of the Minnesota Supreme Court (#3664X), and was there admitted on October 20, 1967. A formal certificate can be made available on request. No ethics proceedings are pending against the undersigned. On September 26, 2017, upon due inquiry, the undersigned was advised by personnel in the clerk’s office of this Court that he need not be a member of the bar of this Court to make this motion under Rule 29(a) of the Federal Rules of Appellate Procedure in behalf of three citizens of the United States desiring to appear as friends of the court in the above-entitled matter. On October 4, 2017, the circuit executive’s office instructed the undersigned to rely on the clerk’s office. On October 5 and 10, 2017, the clerk’s office confirmed that the admission of the undersigned to the bar of this Court is not necessary for this motion under Rule 29(a), and directed filing and service in paper without fee. COMES NOW the undersigned, and he makes the following motion, to wit: That James Fetzer, Ph. D., natural born citizen of the United States and emeritus professor of philosophy at the University of Minnesota Duluth; Mary Maxwell, Ph. D., LL. B., natural born citizen of the United States, previously working in Australia, now present in the United States; and Cesar Baruja, M. D., naturalized citizen of the United States, born in Paraguay, and practicing medicine over the past thirty-seven years, be granted leave to appear as friends of the court in the above-entitled matter through the undersigned as their counsel, and that, if necessary for this purpose, the undersigned be admitted to the bar of this Court generally or pro hac vice, either sua sponte or on motion yet to be made. Attached as appendix B is an uncolored and unbound copy of a proposed submission on the merits, including an addendum of relevant papers from the record, to be submitted in proper format and number as ordered in due course. This effort is funded by Elisabeth Ritter-Blaser, a philanthropist and German-speaking citizen of the Swiss Confederation, living in the City of Oberburg in the canton of Bern. Her interest is preventing wrongful convictions and executions in the United States and other countries. The undersigned has contributed nothing to the funding of this effort, but has prepared this motion. He will argue orally, but only if requested by this Court. Dr. Fetzer, Dr. Maxwell, and Dr. Baruja have all studied and commented on the prosecution of Dzhokhar Tsarnaev. They all protest this prosecution as unfounded upon probable cause, and they verily believe, from their respective and detailed investigations of the facts in this case, and from the work of other eminent experts, including an internet-accessible report of Lorraine Day, M. D., who for many years served as chief of orthopedic surgery at the general hospital in San Francisco, that the prosecution of Mr. Tsarnaev is dishonorable to the United States. Aside from other anomalies not on this record, Dr. Fetzer, Dr. Maxwell, and Dr. Baruja maintain that, during the trial of Dzhokhar Tsarnaev, certain powerful exculpatory evidence on this record, grasped by many astute observers, and sufficient to warrant outright dismissal or acquittal, or an order granting a new trial, went unused and unnoticed by counsel on both sides, including the principal trial lawyer for Mr. Tsarnaev who loudly proclaimed his guilt in her opening statement and did not even ask for a verdict of not guilty during her final summation. It is no less true that major news and entertainment media of the United States have abused the First Amendment by acting together to create false appearances of guilt on the part of Mr. Tsarnaev of grave capital crimes, and to inspire public hatred against him; that Mr. Tsarnaev was misled into making or otherwise has been said to have made false confessions unconfirmed by the corpus delicti; that the said exculpatory evidence was actually generated by the Federal Bureau of Investigation (FBI), and positively disproves essential facts of accusation in the indictment; and that the said exculpatory evidence is referenced and made part of this record by electronic order #1469 issued by the United States District Court for Massachusetts (No. 13-CR-10200-GAO), the same entered on June 17, 2015. The said exculpatory evidence was never heard or considered by the jury, nor was it considered in sentencing. Dr. Fetzer, Dr. Maxwell, and Dr. Baruja note here that key papers referenced by the said electronic order #1469 have been conveniently reviewed in an internet-accessible report, dated August 17, 2015, by Paul Craig Roberts, Ph. D., former assistant secretary of the treasury of the United States. The said report by Dr. Roberts has been read since original publication probably by tens of millions in the United States, Canada, Europe, and Russia. In a nutshell, the FBI crime lab determined from fragments at the scene of the explosions, and the indictment stated in paragraphs 6, 7, and 24 of the general allegations, applicable to all counts, that Dzhokhar was carrying a black backpack heavy-laden with a large pressure-cooker bomb. The FBI then identified as culprits two individuals by reference to a street video which included a still-frame photo showing that Dzhokhar carried a light-weight white backpack. The very evidence used by the FBI to identify the “Boston bombers” referenced in the indictment, excludes Dzhokhar as plainly as white is distinguished from black. 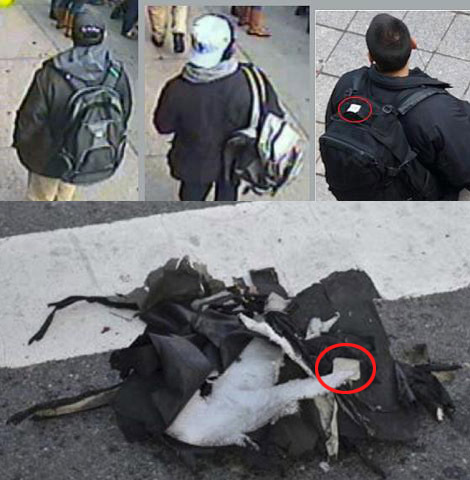 And there are widely published photos of the scene of the explosions showing other individuals carrying black backpacks which perfectly match the projections of the FBI crime lab, but we are aware of no evidence that these individuals were ever investigated. The lawyers on both sides must have known about these exculpatory facts, but played to the gallery as if the street video confirmed that Dzhokhar was guilty. In view of these facts, this Court should view and consider the evidence covered by electronic order #1469, then grant appropriate remedy, — i. e., reversal with order for acquittal as a matter of law or reversal with order granting a new trial. Dr. Fetzer, Dr. Maxwell, and Dr. Baruja believe that allowance of a death sentence under these circumstances amounts to judicial murder in the sense illustrated in Powell v. Alabama, 287 U. S. 45 at 72-73 (1932). Such is their interest here. They submit as authority for their right to intervene and be heard as friends of the court the internet-accessible opinion of Judge T. S. Ellis III, published on February 27, 2006, in United States v. Steven J. Rosen and Keith Weissman, No. 1:05CR225-TSE, Document 228, on the docket of the United States District Court for Eastern Virginia. Pursuant to 28 United States Code, Section 1746, the undersigned swears, subject to the pains and penalties of perjury, that he has conducted himself and will conduct himself before this Court in an upright and proper manner, that he will support and has always supported the United States Constitution, and that all representations hereinabove are true to the best of his knowledge, information, and belief. This oath is made abroad, subject to the laws of the United States. All roads in the Trump-Russia witch hunt lead to Barack Obama...at least that is what his former intelligence czar James Clapper admitted to fake news, CNN's Anderson Cooper. Former Director of National Intelligence (DNI) James Clapper admitted in a CNN interview Saturday that former President Obama instigated the ongoing investigations into Donald Trump and his inner circle of advisors and staffer. "Karen Handel, a Republican, defeated Jon Ossoff, a Democrat, in the most expensive U.S. House race in history. The election was largely seen as a referendum on the first months of Donald J. Trump’s presidency. Republicans maintain control of the seat, which was vacated by Tom Price, the new secretary of health and human services." Small countries or cultures need to protect themselves against larger countries and cultures. In the end a larger country or culture can end up subsuming another. Why do people hate feminism? Because there is absolutely nothing that a feminist won't censor and they will lie to your face while they do it. The flip side to banning grid girls and other models at male events, and the banning of strip clubs would be the banning of male strippers and other forms where the male physique is on show. In the end we will all be wearing potato sacks. Record heat in Scandinavia brought by the remnants of a warm water hurricane pulled into the atmospheric flow, centering that heat over northern Europe. All the while 2000 miles west, its snowing in Canada with well below normal temperatures. Looking at temperatures across N. America, doesnt seem like the end of the world heat, at all. You decide if what you are being told in the news is true. Some background and analysis to the White Helmets evacuation in Syria. Apparently White Helmet members were assassinated before and during the Army operation in Daraa to stop them staging false flag terror events. This is why you did not see any of this type of propaganda recently. Those evacuated were likely Al Qaeda types. The video also talks about the Iranian withdrawal from Syria that will lead to the US withdrawal which will lead to Kurdish reconciliation with the Government. All of Syria is set to be retaken by the Government side. Indira Singh explains about Ptech, the company with numerous investors and managers with direct links to terrorist financing. Ptech’s clients included the CIA, FBI, the White House, the Department of Energy, the Air Force, the Navy, the FAA, IBM and Enron…Yet Singh learnt they were a CIA front company and their software could gain control of the most sensitive computer systems in the country. The last few days have been truly amazing. I didn’t even write an article yesterday; I’ve just been staring transfixed by my social media feeds watching liberal Americans completely lose their minds. I can’t look away. It’s like watching a slow motion train wreck, and everyone on the train is being really homophobic. I’ve been writing about Russiagate since it started, and I can honestly say this is the worst it’s ever been, by far. The most hysterical, the most shrill, the most emotional, the most cartoonishly over-the-top and hyperbolic. The fact that Trump met with Putin in private and then publicly expressed doubt about the establishment Russia narrative has sent some political factions of America into an emotional state that is indistinguishable from what you’d expect if Russia had bombed New York City. This despite the fact that the establishment Russia narrative consists of no actual, visible events whatsoever. It is made of pure narrative. Nothing about the establishment Russia narrative is in any way verifiable, and the only thing it has in common with 9/11 is the media coverage and widespread emotional response. September 11 had actual video footage of falling towers. You could go visit New York City, look at the spot where those towers used to be, and see them not being there anymore. You could learn the names of the people who died and visit their graves and talk to their family members. Exactly how it happened is a matter of some debate in many circles, but there is no question that it happened. There was an actual event that did happen in the real world, completely independent of any stories people tell about that event. Russiagate is like 9/11, but with none of those things. It’s like if 9/11 had all the same widespread emotional responses, all the same nonstop mass media coverage, all the same punditry screaming war, war, war, except no actual event occurred. The towers were still there, everyone was still alive, and nothing actually happened apart from the narrative and the emotional responses to that narrative. On Saturday Judicial Watch president Tom Fitton announced that the DoJ was finally responding to a Freedom of Information Act request to hand over documents related to warrants on Trump campaign figure Carter Page obtained from the secretive Foreign Intelligence Surveillance Act court. It took a year for Judicial Watch to receive those documents. And though the arrived heavily redacted, there is are already a few bombshells that can be gleaned from them. For one, anti-Trump FBI thug Peter Strzok may have perjured himself in his recent testimony before a joint hearing of the House Judiciary and Oversight committees when he claimed he had nothing to do with obtaining those FISA warrants against Page. Either Trump is compromised or a large chunk of the government is complicit in claiming so in order to usurp a duly elected president. Neither situation is particularly great. Strength via diversity is a misnomer. Society in Europe is being fractured, culturally, and also in terms of affluence with a growing underclass. The pesticide industry is widely viewed as being just as toxic as the chemicals themselves, but now new evidence unearthed by the Poison Papers has shown that toxicity extends all the way up to government regulatory agencies. Corruption and collusion in government is a disease — and its spreading at the behest of chemical manufacturers looking to make profits at any cost, even at the expense of human life. Internal documents from a number of agencies show that officials from administrative agencies like the EPA have been taking action to cover up the dangers of pesticides and the faulty science behind their “safety” studies for decades. Australia smashing all time cold records throughout the east coast. While not the coldest winter across the entire country, extreme cold and coldest in 60 years with huge snowfalls that have officially opened all ski resorts in Australia. Forecasters called above temperatures in May, but now this Australian super-freeze 2.0 has left them silent. Japan still in chaos as once in 1000 year floods decimated the lower half of the entire country and now summer temperatures are getting into the normally warmest part of the year Late July / August in the Pacific. Israel has evacuated over four hundred members of the controversial White Helmets group and their families to neighbouring Jordan, after Canada, Britain and Germany reportedly agreed to accept at least some of them as refugees. That's after Syrian government forces launched an offensive against militants in the south of the country, where members of the group were located. The Zionist movement has always been a schizophrenic one. The mainstream ruling factions of the movement, and later of the state of Israel, once claimed to be “socialist” in character. But in fact, the “labour Zionist” tradition that included figures such as first Prime Minister David Ben Gurion, war criminal and Nobel Peace Prize winner Shimon Peres, down onto the racist, anti-Palestinian leaders of the current Israeli Labor Party has always been an exclusionary settler-colonial movement, of a fundamentally racist character. Peres claimed to be a great “peace” leader, but in fact he was instrumental in promoting Israel’s arms trade around the world. He also worked closely with the white supremacist regime in South Africa during the 1970s, on nuclear arms technology and testing – a relationship that was beneficial to both apartheid regimes. The same kibbutzim collectivised settlements which were so admired by everyone from the Labour Party left in the 1960s to the renowned American Jewish leftist Noam Chomsky were in fact institutionally racist – and still are. Not only were they built on land stolen from Palestinians, who had been expelled by force, but these “socialists” actively excluded Arabs from membership of their collectives. Some of the worst crimes of the state of Israel were historically carried out by the “labour” Zionists, and not the Zionist right – including the 1948 ethnic cleansing of Palestine. The idea that there is any such thing as a genuinely “progressive Zionism” has always been a cruel fallacy. But the narrative that there is some sort of good, pure, original form of left-wing Zionism that has somehow been corrupted by right-wingers like the current Israeli Prime Minister Benjamin Netanyahu has proven to be a useful one for Israeli propaganda purposes. But in fact it is just that: propaganda and a lie. The new “Israel as the Nation-State of the Jewish People” law that the Israeli parliament just passed, formally enshrining apartheid practices against Palestinians, is a useful illustration of the actually existing differences between the Zionist “left” and the Zionist “right”. There has been some minor, muted criticism by liberal Zionist groups of the new law. But the differences are purely tactical and based on the idea that the new law is bad PR for Israel, rather than any fundamental difference over principles. The Israeli Labor Party fully agrees with the Likud that Israel should be a state for the Jews alone, it’s just that they think to state it so openly in front of the world’s press is bad for Israel’s image abroad, and thus for its continuing international support network.